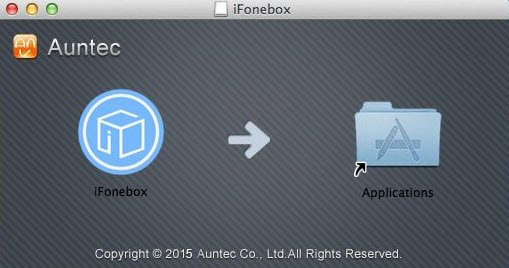 iFonebox for Mac is a specialized iPhone, iPad or iPod Touch data recovery tool, allowing recovering deleted or lost data from iDevice, as well as from iTunes or iCloud backup file. It allows recovering Contacts, Notes, Messages, WhatsApp, Call History, Calendar, Reminders, Safari, WeChat Contacts, and WeChat Messages etc selectively on your Mac computer. iFonebox for Mac offers three recovery modes including recovering from iDevice, recovering from iTunes and recovering from iCloud backup. No matter how you lost your data, you can find a solution with iFonebox for Mac, with which you can selectively recover the deleted or lost data of certain category and select whatever you want to recover and transfer. This feature is intended for those who deleted or lost data from their iPhones, iPads and iPod touch and want to get the data back directly from the iDevice. To successfully retrieve the lost data from your iPhone, iPad or iPod Touch, you should perform the recovery immediately after the data loss happen. At least you should stop using your device again or the newly generated data will be overwritten and erased. If your device is broken or stolen and not accessible any more, you can recover the data from iTunes backup file if you have synced your iPhone, iPad or iTunes to iTunes and created iTunes backup file for everything previously stored on your iPhone. If you have backed everything up to iCloud, there should be an iCloud backup file for all the data saved on your iPhone, iPad or iPod Touch before the data loss or deletion. 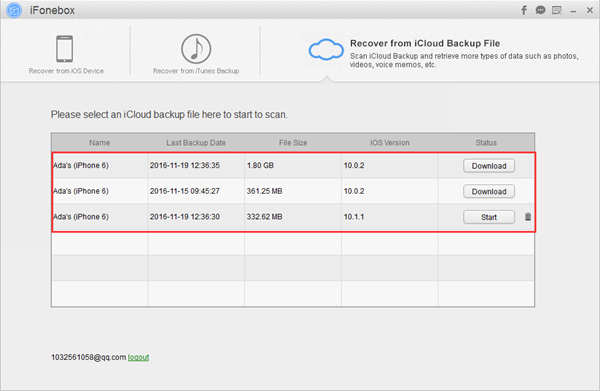 You can choose this recovery mode to recover deleted or lost data from iCloud backup file. 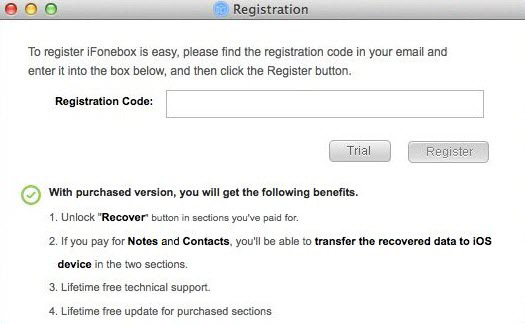 Download: You can download iFonebox for Mac from home page, product page, guide page or right here. It’s virus-free and fully compatible with OS X EI Capitan, Mac OS X 10.10, 10.9, 10.8, and the ealier versions. Locate installation package of iFonebox which is named as .dmg from your Mac. Double click on it and drag the icon of iFonebox for Mac to the Applications folder. As the trial version only allows you to scan your device like iPhone, iPad or iPod Touch as well as your iTunes or iCloud backup file and locate the lost and deleted data, you need to pay for the full version if you want to recover and transfer the data to your computer virtually. It is easy to register to the full version after you have got the registration code. Click on the tab of Help on the top right corner to expand the pull-down menu and hit the option of “Register”. A window will pop up asking you to enter the registration code to accomplish the registration. It’s very necessary to update iFonebox for Mac to the latest version, because each new version is released with bugs fixed and new features added. You can check for update by choosing and clicking the option of “Check for Update” from the drop-down menu of Help tab. When there is new version or update available, there will be a window popped up when you launch the iFonebox to inform you about the update. Uninstalling iFonebox for Mac is pretty simple: drag the icon of iFonenbox for Mac, either on the desktop or in the Applications folder to the dustbin. iFonebox for Mac allows you to recover data including contacts, messages, call history, Calendar, notes, Reminder, WhatsApp conversions, Photos and Voice memos recently deleted from your iPhone, iPad and iPod touch. Here is the supported devices and files list. 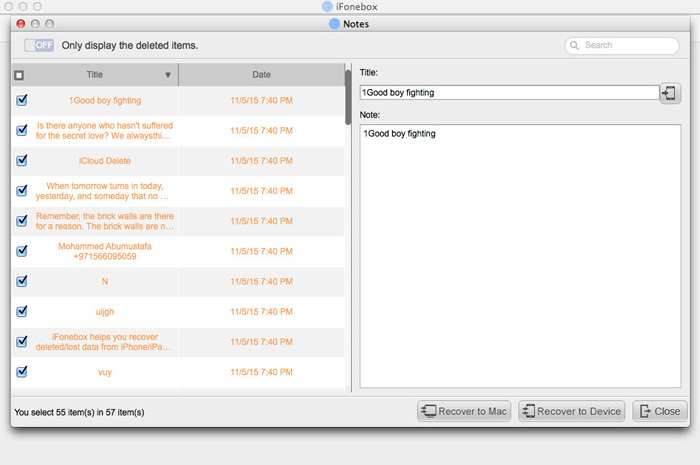 Install and run the full version of iFonebox for Mac. Connect your iPhone, iPad or iPod Touch to your computer. Hit the button of “Start” after your iPhone is detected. In this way, you have chosen the recovery mode of “Recover from iDevice”. Choose the data you want to recover selectively from the interface listing all the supported data categories. If you want to recover all the supported data, just click “Recover All” from the top right corner. Preview all the exported data and choose what you want to transfer to your Mac computer. Tips: If you are trying to recover contacts and notes, you can choose to recover the exported notes or contacts items directly to device by hitting “Recover to Device”. If you have ever synced your iPhone, iPad or iPod Touch to iTunes, you should have an iTunes backup file on your computer. If your device is not at hand, or your device is simply not accessible, you can choose to recover the lost or deleted data selectively from the iTunes backup file. Install and launch iFonebox. Choose the recovery mode of “Recover from iTunes Backup”. Then all iTunes backup files on your computer will be immediately found and displayed on the interface. Choose an iTunes backup file from which you want to recover lost or deleted data. Note: If there are more than one iTunes backup files for your device, choose the one which contain most data from your iPhone, iPad or iPod Touch, mostly should be the one with the latest date. Choose the data you want to scan by clicking on the related icon from the interface presenting all the supported data types. It will take some time for iFonebox for Mac to scan your iTunes backup file, please wait for a while patiently. After the scanning and analyzing is finished, please preview all the exported items and select what you need to recover and transfer. If you have ever backed up your iPhone, iPad or iPod Touch regularly to iCloud, you should have more than one iCloud backup file stored within your iCloud account. And you can export or recover the lost or deleted data from the iCloud backup file, especially when you don’t have iTunes backup file or your iPhone is currently not accessible. Install and run the full version of iFonebox. 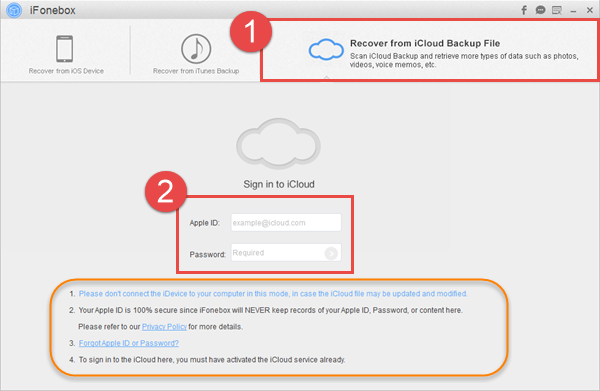 Choose the recovery mode of “Recover from iCloud Backup”. You will be asked to sign in to your iCloud with an Apple ID. After signing in successfully, a group of iCloud backup file will be presented for your selection. Choose one from which you want to recover data to download. Note: Downloading the iCloud backup file could be time consuming, and thus you can choose data of certain types to download rather than downloading the entire iCloud backup file which will save a lot of time. After the downloading process is finished, please choose the data you want to recover. And iFonebox will automatically starts scanning for the data you have chosen. After the scanning process is finished, please take a look at the exported data items and check to select what you need to recover and transfer.